Instead of the usual humid days- heat, heavy air, the kind that according to Val's sister, Nancy, "covers you like a blanket. ", September has already proven to be cool, crisp and a true harbinger of fall days. And school days. The weather this week heading into Labor Day has been cool and crisp every morning, sweatshirt worthy at night. The kind that makes you think about backpacks, homework and an apple for the teacher. Melancholy is the the feeling in the air at our little house at the end of a busy, exceptionally fun summer full of beach days, jumping off the dock, wiffle ball games, sleepovers, ice cream sundaes and toasting marshmallows in the backyard. I used to become incredibly happy about back to school, the excitement of the kids meeting new friends, more freedom during the day for me, a rest from the kids bickering over the t.v. remote. But now I am already sad for the loss of summer fun and the long days spent digging my feet in the sand, sitting in my beach chair while watching the kids run back and forth from swimming to huddling for a brief moment in their sandy towels before they took off again with their friends. Out of earshot but not out of sight. I've felt this way since about the middle of August, knowing the end was coming near and here it is just a few days away. But all is not lost. September brings it's own schedule of busyness. Meeting the teachers, making new friends, soccer and dance schedules begin, again. It is a time to renew, recharge, refresh, something to look forward to. It is however, a little more bitter than sweet. That is why I am now adopting a new phrase for this feeling that hovers near my heart in anticipation of next Tuesday morning. A few days ago, an adult asked Declan how he was feeling about getting back to school, Declan paused for a moment, likely reflecting on his summer of fun while projecting himself into his upcoming soccer season and daily after lunch recess basketball games that he will play with his friends, he replied, "Bitter/sour". Exactly. Leaving summer behind is bitter and school is, well, school is likely more sour than sweet but nonetheless, sour is still a flavor that even though it can torture our taste buds at times, most of us like it, at least a little bit. While this ice cream recipe is not at all bitter and not even remotely sour, it does soothe a lot of those feelings. 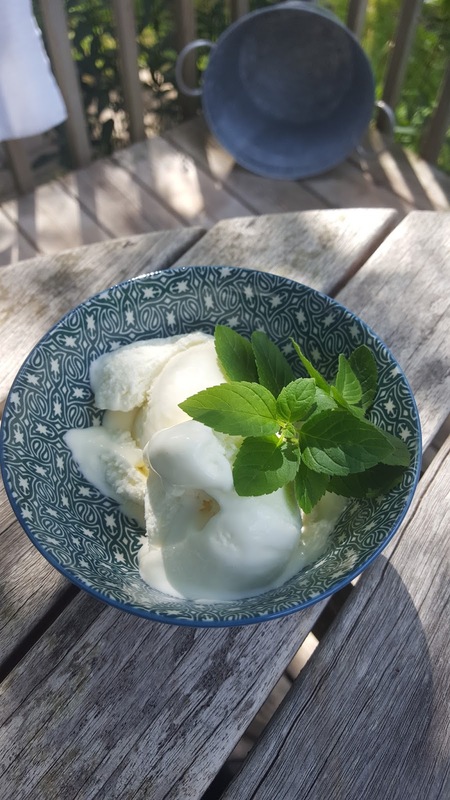 Declan's favorite flavor is mint, so this is a summer staple in our home. The flavor is earthy and naturally cool and minty, reminding me of nibbling a few leaves off the plants near the spigot, where the hose drips in Val's yard, on the side of the house where the sun shines bright. I make a few batches and stash them away in the back of the freezer to savor during those times when we are really missing warm, sunny days that last into the evening full of friends and endless summer fun. *You will need an ice cream maker to spin the ice cream at the end of this recipe. Set aside 2 tablespoons of the milk. Whisk the cream cheese and the salt in a medium bowl until smooth. Fill a large bowl with ice and water. Combine the remaining milk, cream, sugar, and corn syrup in a large saucepan. Bring to a rolling boil over medium high heat. Boil for 4 minutes. Remove from heat. Mix cornstarch and 2 tablespoons of reserved milk to make a slurry and add to saucepan. Bring the mixture back to a boil over medium high heat while stirring until slightly thickened (about 1 minute). Remove from heat. Gradually mix hot milk mixture into the cream cheese until smooth. Add the mint. Pour entire mixture into 1 gallon Ziploc freezer bag and submerge in the ice water bath. Let stand for about 30 minutes. Refrigerate for 8 to 12 hours. Mix ice cream: Strain out mint. Pour the ice cream base into the frozen canister and spin until thick, aerated and creamy. Immediately scoop into pint size containers. Press a small piece of wax paper to the top of the ice cream and cover. Freeze until firm, about 4 hours before serving.